Mayor Bill de Blasio is expected to convene a summit with 20 mayors around the country on Monday to discuss how to implement President Barack Obama’s newly announced temporary reprieve programs for immigrants who came into the country illegally, according to a press release from the mayor’s office. On Nov. 20, the president laid out his latest plans to allow roughly 5 million of the country’s 12 million undocumented immigrant population to stay in the country and receive work permits. Obama said that his executive action was necessary in light of Congress’ failure to pass a comprehensive immigration reform bill. On the same day, Mayor de Blasio announced that he and a group of mayors would meet at Gracie Mansion to come up with ways to reach immigrant communities and get them signed up for the president’s programs. They would also discuss strategies to push for an immigration reform bill to get passed. Under the president’s executive action, undocumented parents of U.S. citizens and legal permanent residents can now apply to have a work permit and stay in the country for three years. Obama also expanded a program he announced in 2012 for certain immigrants who completed their high school education in the United States and entered the country before they turned 16, known as DACA (Deferred Action for Childhood Arrivals). In New York State, an estimated 338,000 people can benefit from the executive action, according to an analysis by the non-partisan think tank, Migration Policy Institute. It is the state with the third-most eligible population, behind California and Texas. Cities with participating mayors include San Francisco, Atlanta, Seattle, and Dayton, Ohio. A total of 27 cities will be represented through mayors and senior officials. 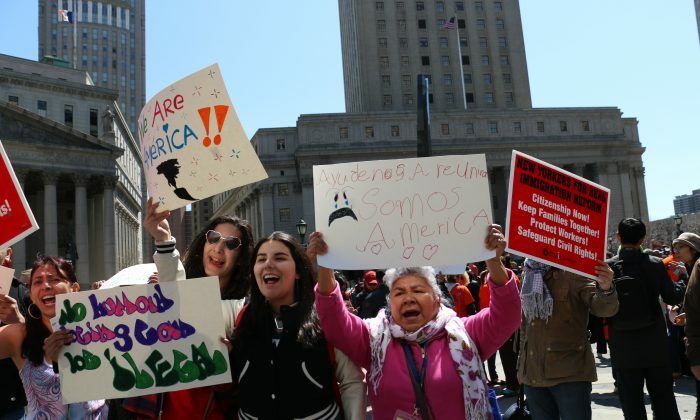 Local immigrant advocacy and legal service organizations have already begun to gear up. Last Thursday, a group of organizations and the state’s Office for New Americans announced at a press conference that they would collaborate together to provide services and reach out to the immigrants who are eligible for the deferred action programs. The project is called the New York Immigrant Assistance Consortium. They cited not only a challenge in having to assist hundreds of thousands of potential applicants, but also getting immigrants to overcome their fear of disclosing their undocumented status to government authorities. At the press conference, Neena Dutta, chair of the New York chapter of the American Immigration Lawyers Association, said that with the DACA program last time, people were worried that revealing their status would put their family members at risk. Many were also concerned about the temporary nature of the relief programs. The programs do not provide a path to citizenship, or legal status. A future president can also rescind them. The work permit and temporary status will allow immigrants to pay taxes and apply for a social security number and certain state-funded benefits. In New York, they can apply for a drivers’ license too. Rosenblum also noted that because many undocumented immigrants live in the shadows, it might be a challenge for advocacy and community groups to find the people who qualify for the programs and let them know they can apply. “They don’t want to make themselves known. Getting information out to people will be a challenge,” he said. The Consortium hopes that the collaboration between different organizations will improve outreach efforts. “It’s an attempt to have as many actors as possible who are able to not only reach out to immigrant groups across the state, but eventually provide pre-screening, and funnel them to legal service organizations, to help with applications,” said legal initiatives coordinator at the New York Immigration Coalition, Sam Palmer-Simon, via a phone interview. The Coalition is a member of the consortium. Another challenge is that some immigrants lack the paperwork that would prove their eligibility for the programs. “If they’re working a cash job, they don’t have pay stubs. Or they don’t have proof of ID,” said Ju-Bum Cha, director of education and communication at the MinKwon Center for Community Action, another consortium member. But many people have expressed interest in the president’s executive action so far, said Cha, speaking through a phone interview. About 100 people have requested MinKwon’s assistance in applying when the applications become available. The U.S. Citizenship and Immigration Services office will open applications for the expanded DACA program in February 2015, while the program for parents (called DAPA, for Deferred Action for Parents of Americans) will open applications in May 2015.